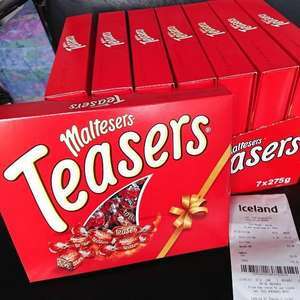 Just been in to local Iceland and they had 360g boxes of Maltesers for £1.50 (= 41.6p/100g). Showing online so is national. Very pleased. The staff were not aware of the lower price and I bought 5 boxes! Happy days! Pretty good, maltesers haven't really dropped below 80p/100g in years. For some reason they have never seem to compete with other products, it's just a round Crunchie bar. Better not...I'd eat the whole box. Hop fast to get a Maltesers Bunny 29g instore at Asda in Strood. Love these but live nowhere near an Asda, which is probably a good thing! (embarrassed) Heat from me. Apologies to residents of N16 since I snaffled the last eight boxes from the Stoke Newington store. National and online. I can't take to these. I only love the balls! 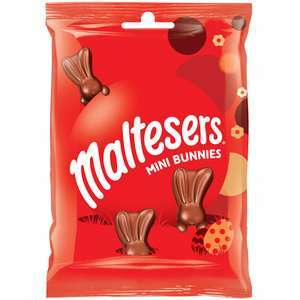 Leamington Spa (not sure if national) Pound Shop are selling Maltesers MaltEaster Mini Bunnies for 25p per 58g pack, dated until 15.12.19. A milk chocolate egg with crunchy pieces, 2 maltesers bunnies and 1 bag of mini bunnies. 496g. Also had galaxy giant crunchy egg £4.99. Found in Cleckheaton maybe store specific. 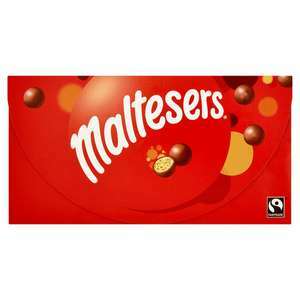 496g of malteser yummyness for £3.99 is a bargain. Totally agree. This stuff is awful. My kids won't touch it, but they go through Nutella like nobody's business! Not sure but likely it has. The cheap stuff haz palm oil. Cold for me too. But need confirmation. If you love Malteasers you have to NOT buy this. Buy Malteasers. If you like chocolate spreads buy Nutella or similar. This product is neither. Not nationwide though as my local doesn't even sell them. 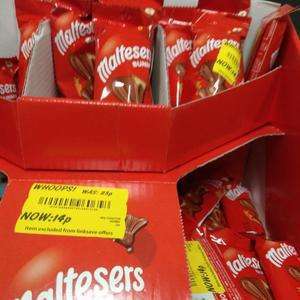 Never miss a 'Maltesers' deal again! I just buy normal vanilla ice cream and top with loads of malteasers! do they have a soft filling? maltesers have a hard filling but looking at the photo, it looks like there is a soft filling in the truffle? Not really, but strange in comparison. Got that flavour initially, but trying to go "upmarket". They still have plenty in Horncastle store at this price (moved to the reduced section). Never tried these before. Are they like maltesers? That’s a lot of boxes to shift. Not in the one I've just been in they were about £1.20 I think. I’m confused too koksy, proof that some supermarkets are a law unto themselves eh? Cool, shame the nearest Asda to me is over 50 miles away, one of the disadvantages of living in the sticks. Confused. I bought these about a month ago and they were £3.50 and they didn't say they were on special offer. Ikr I’d have bought a car full :D unfortunately it won’t let me delete it so I’m going to have contact the mods. Tis in discount stores. Weight has reduced again ridiculously...146g, 120g, 100g.. I thought that was the normal price? They also have 2 packets of Tyrells crisps - 150Gm each for £1.50. I checked other WHSmiths and they are selling 1 bag for £1. In Penzance on clearance end of isle,25p. Although they were going through till at 50p but member of staff corrected price. Already been mentioned, I was unable to see it online though.